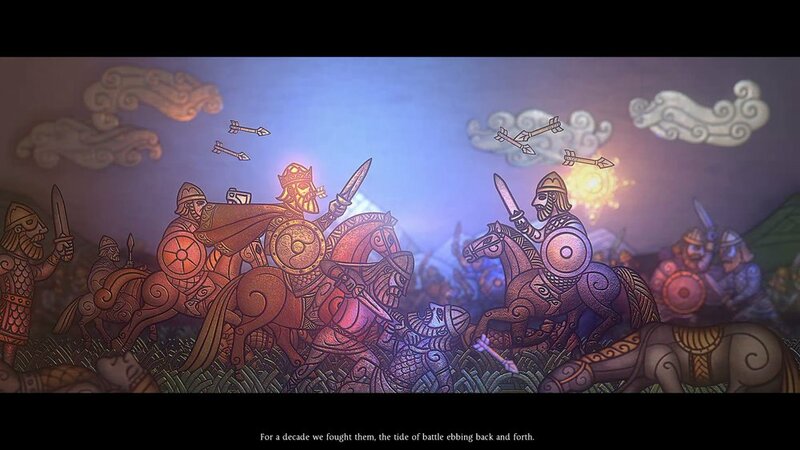 Experimentation in big budget games is not something that happens very often. Sure, I say this in the shadow of God of War, a rather successful experiment that showed change in itself is not anathema to selling well or being well-regarded critically. More often than not, though, a successful series sees only incremental changes between releases, with the most extreme examples seen in sports games. 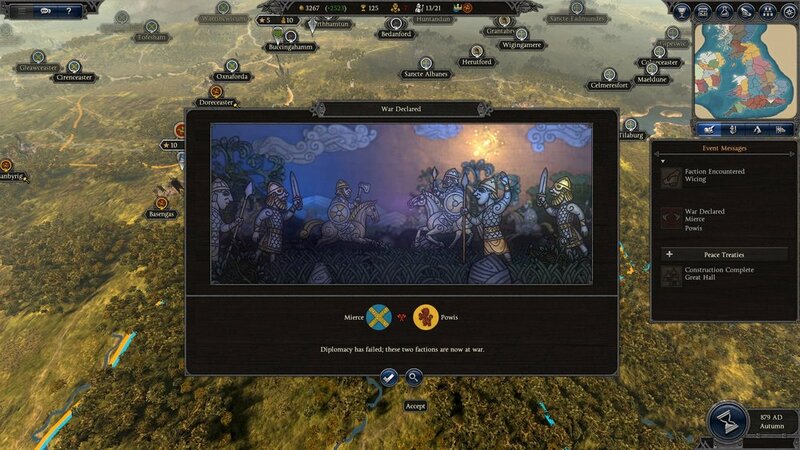 So, when Creative Assembly announced Saga series of their Total War games, focusing on specific periods of time while also messing with the formula in unique ways, I was interested enough to spend some time away from my Warhammer Dawi to see what the developers were up to. The result is a game that is not great, but good in enough ways that if you seek a diversion from the wider main titles, Total War Saga: Thrones of Britannia can easily fill that need. One of the largest and most easily recognizable changes in Thrones is the scope of the game. Picking up after Alfred the Great’s defeat of the Vikings in the year 878, Thrones deals specifically with the British Isles, the island of Great Britain and Ireland. Split between about ten factions, you deal with the aftermath and your own faction’s designs on the Isles itself, as obviously, only your faction is capable of uniting the people and ruling the land. One of the overall downsides to Thrones is the sameness of the factions. Each is a variation on human, whether they are English, Gaelic or Viking, as opposed to both race and tonal differences with the factions in a larger release like Warhammer. The factions have little differences that set them apart, like the Vikings overabundance of ax melee units, or the Gaelic archers being more than an arrow shaft better than any other ranged units. The lack of real variety didn't lead me to experiment with playstyles that varied wildly. The faction goals do add a little bit of flavor to the proceedings, with each faction earning bonuses or penalties depending on how well you perform. The Gaelic, for instance, gain bonuses from being extremely religious, with buildings like churches serving as sources of income as well as offering boons to the public order. The Welsh, on the other hand, have a system called heroism, which heaps on the positives as you win battles and conquer lands. Little differences like these provide context to certain actions, something that is desperately needed when everything else winds up being so very similar. Another large change is seen in the provinces/cities you hold or capture. Split between smaller towns and larger capitals, city and structure buildings now has more to do with individual specific functions. For instance, in addition to needing money to raise and keep armies, food and supplies are added to the list of things you need to keep track of. Food is grown in the smaller towns, where you often find places like farms, while major investment ventures, like churches and garrisons, are only found within the province capital. 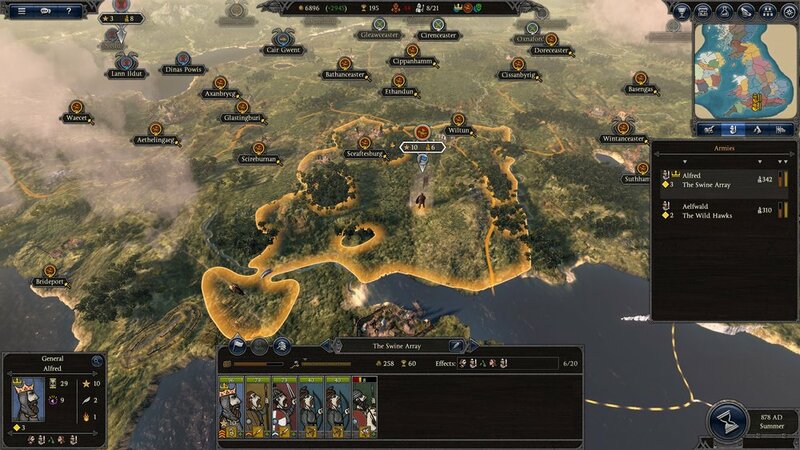 Unlike other Total War games, smaller towns can now no longer build garrisons, which means if there is no army sitting on them to defend them, they can be taken with nothing but a small band of soldiers. That can often leave you at a resource disadvantage if you're spending your time and forces fighting against much larger armies. But, you say to yourself, as long as I'm paying attention, I can throw an army together fairly quickly to defend, can’t I? Not any more. In one of the more interesting changes - and one that might very well find its way into future games in the series - armies are no longer available at full capacity. Instead, you recruit, say, a group of archers, and start with a small group, with the rest arriving over the next couple of turns. Thematically, it functions just like a lord putting a call out for people willing to fight. It takes time to reach the people, and time for them to get to you to fill out your ranks. This makes battles even more tense, as it takes time to recoup completely from heavy losses, and there are not always forces available, as the total available to call on also takes time to replenish. Battles meanwhile, one of the main draws of the series, has seen very little in the way of changes. They are still furious affairs of clanging steel and galloping hooves, though small improvements were made to add to the overall feel. Weather is now a concern, with that famous British fog playing a role in things like visibility, so each battle now allows you to wait a total of three additional days for more favorable conditions. Armies traveling in foreign territories can also start to suffer from attrition if their stock of supplies falls too low, so long engagements may force you into battle with less troops then you rolled in with. Diplomacy can also be affected by the passage of time as your governors, playing the secondary role of the missing “Hero” units, and generals age. Governors can be moved between cities you control, and with shifting stats like loyalty and the ability to marry off or even murder unhappy followers, there’s a whole game within the game in how you rule, not just how you conquer. These little touches were all greatly entertaining, and I’m certainly hoping Creative Assembly finds a way to work dwarf courtship into TW:W3. The Grudgebearer deserves an equally awesome queen! Also changed are the tech trees, with your actions in game leading to better technical advances rather then simply constructing a specific building in your capital. Want better spearmen? Train up a lot of them, and watch their experience grow. Better siege weapons? Well, you need the experience of sieges to learn what works and what won't. Also, rather than earning followers for your generals through battles, as was the old way, now you put points into followers by leveling up. It works almost as well as placing specific points in the various skills you wanted, but is a bit more free-flowing, keeping you from adhering strictly to a tree to achieve certain benefits. The game looks stunning, with weather shifting between days and seasons changing as time goes by. Winters, with the ground covered in snow, look amazing along northern Scotland, and the cold can even lead to attrition in your ranks if your men aren’t equipped to handle it. But the winner of best visuals in Thrones, far and away, are the siege battles themselves. Creative Assembly has outdone themselves with the tiered set up of some of the larger cities, with sieges breaking up into point capture affairs as your army fights its way through multiple gates. Unlike the castle sieges of Warhammer, which I rarely wanted to engage in if I wasn’t forced, fighting through the streets of a Lunden felt both exciting and impactful. 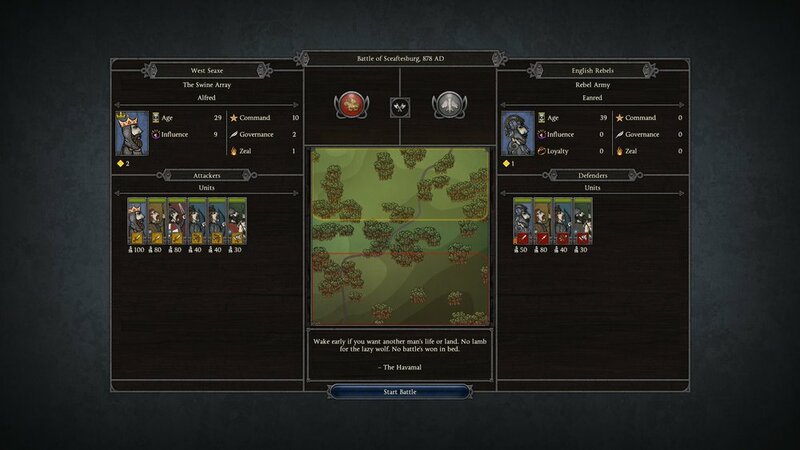 While the sameness of the factions began to bother me after a time, and will keep me from revisiting this one as much as I have the previous games, Thrones of Britannia does a fine job of shaking things up a bit. Not every change was welcome, but certain things, like army recruitment and siege battles, clearly came out better because of it. While my eyes are firmly set on the DLC releases to TW:W2, which are coming out at a steady pace, I did enjoy this diversion to the British Isles, and look forward to more Sagas when Creative Assembly wants to shake the tree up a bit. Total War: Warhammer 2 is fantastic. It is everything good that the first game brought with enough fixes and flourishes to make me not feel bad about there not being any damn dwarves for me to play. 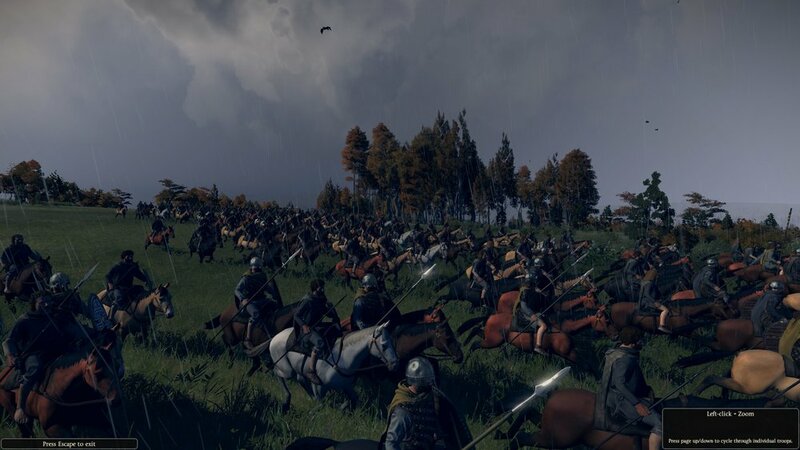 Even though it doesn't innovate much from its predecessors, it stays true the core mechanics that has made the Total War series some of the best strategy games to date. I don't think I've reviewed another game that drew such a hard line in the sand for me. If you're a fan of Game of Thrones, there is no doubt in my mind that you should pick this up. I cannot wait to see where this goes and how the rest of the story fits into the wider universe HBO adapted from George R. R. Martin's novels. If you are a non-fan, there is certainly enough here to make a compelling argument for why you should be one, but I fail to see why you would even care to start. Seeing as I clearly fall into the first camp, I'll spend my days anxiously waiting for the next episode, and hope that you, person with your head in the sand who hates fun, decide to come along for the ride. Sure, I may have some grudges that may never be removed from the great book, but in the end, this is the best experience I’ve had, bar none, when it comes to real time strategy games.